PIQUA – Gov. John Kasich recently appointed a new trustee to the Edison State Community College Board of Trustees. Elizabeth Simms Gutmann was sworn in during the June 6 board meeting at the Piqua campus. Gutmann earned her Juris Doctorate at the University of Cincinnati College of Law and holds a bachelor’s degree in communications from Wright State University. Gutman spent 18 years, from 1999–2017, serving the Miami County Municipal Court. Gutmann was previously employed as a prosecutor for the City of Piqua and prior to that as an assistant public defender for Shelby County. She began her legal career in 1984 as an associate with McCulloch, Felger, Fite & Gutmann Co., L.P.A., where she now serves in an of counsel position. Gutmann and husband of 35 years, Attorney Michael Gutmann, are the parents of Claire Hodapp, assistant in house counsel for Rising Star Casino in Indiana, and William, a graduate of The Ohio State University, Moritz School of Law. Will is currently employed at Squires Patton Boggs (US) LLP in their Columbus office. The newest member of the family is granddaughter Louisa Valentine Hodapp. 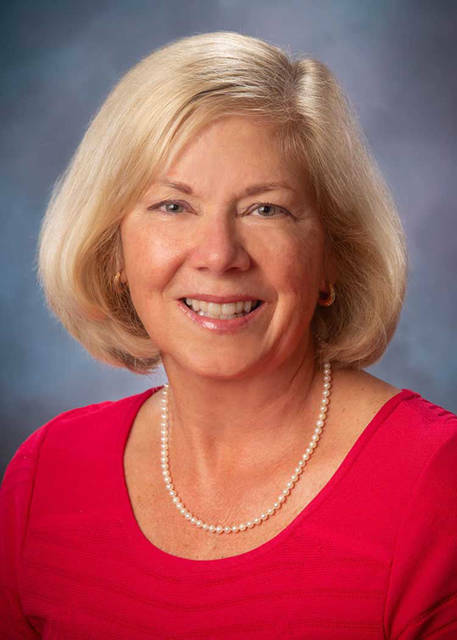 An active member of her community, Gutmann is currently serving as president of the Miami County YMCA, board member of the Miami County Park District and regional representative to Bike Miami Valley for Bike Piqua. Over the years, she has volunteered her time on behalf of many organizations including Piqua Catholic Schools, Lehman High School, Miami County CISV, Bruckner Nature Center, Miami County Family Abuse Shelter and the Girl Scouts.